Pergola offers an enjoyable and comfortable way to enjoy your outdoors. These structures extend your outdoor functionality regardless of the weather. To guide you in installing the right type of pergola, here are 4 pergola materials you can consider. 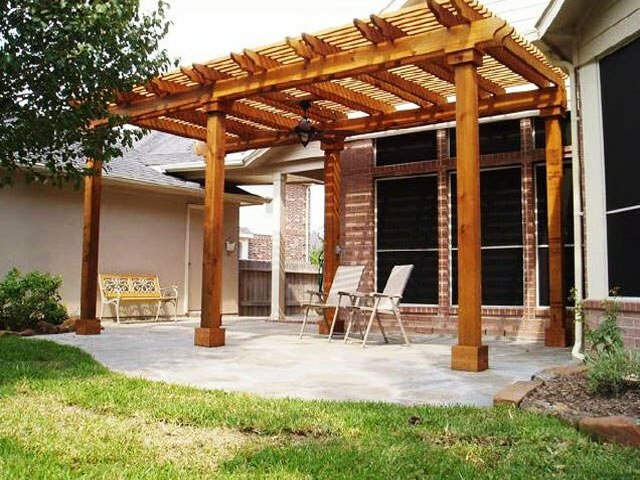 One of the most popular pergola materials and most common is wood. Landscape architects love working with wood since it’s highly customizable and can easily be adjusted in size or shape if needed. There is also a wide range of wood types to choose from, whether it’s redwood, cedar or chemically-treated wood. It also effortlessly elegant and classic with its wood grains, giving a homely atmosphere outdoors. However, going with a wood pergola means doing annual maintenance to prevent the wood from succumbing from wood rot and weather damage. If painted, you would also need to regularly re-paint it to keep its original appearance. Sleek and modern, steel pergolas give a chic simplicity to your patio cover. There is also a wide range of options available for you in terms of color, size, finish and type. This makes a metal pergola flexible and easy available. It’s also weather-resistant, making it a sturdy choice. But remember that with metal pergolas, you might have to ask your preferred landscape contractor whether they know how to install a metal pergola. This is because these metal ones will need special tools so you can further customize it. A metal pergola kit can also be quite expensive. An easy-to-install pergola kit, an aluminum pergola is also a low maintenance type which makes it a favorite among homeowners. You can also have it come in either a solid cover or open lattice type. Like steel pergolas, aluminum ones can also be costly and will also need special tools. To install one in your yard, make sure to find experience landscape contractors to do this for you. Made from PVC material, a vinyl pergola boasts of its durability, strength and stability. It will certainly not rot, be plagued with insects or need annual maintenance. However, vinyl pergolas may be prone to yellowing and discoloration. You may also need to check if the manufacturer offers warranty. It might not be as expensive as the other pergola materials but you may need to replace it after a couple of years. Whether your outdoor space is big or small, an outdoor kitchen can still fit. It all depends on the type of outdoor kitchen setup you have in mind. Browse our 3 highly recommended setup types and see which fits your outdoor space perfectly. Chat and cook at the same time in this kitchen that has everything an entertainer needs. Give your guests space to sit and relax with your workspace within their earshot. This next outdoor kitchen layout follows the same principle. But when it comes to counterspace, you have different levels for both food preparation and presentation as well. If someone needs a drink, the fridge is conveniently nearby to let you get them their chilled beverages. A spacious backyard with lots of potential, this project created a full-fledged outdoor kitchen complete with a patio cover and stamped concrete flooring, to make this family’s outdoor cooking a true feast. There’s also ample space for guests and friends to roam around or set up a seating area in the midst while waiting for the meats to cook. Meanwhile a variation of the classic outdoor kitchen execution has come full circle by having the kitchen and dining area in one setup. There’s also a clever use of vertical space with attached floating cupboards for dinnerware. It’s the best of both worlds. Being out of doors cooking your favorite meal while still being protected from harmful weather elements, it’s no wonder indoor-outdoor kitchens remains to be one of the top projects for home owners. In this project, for example, instead of having a simple seating space in their patio, they had the patio perimeter converted to a kitchen countertop with storage and custom-fitted for the kitchen equipment & features they needed. Meanwhile, this pool lounge area became multi-functional with a compact kitchen on the side. A pergola overhead lets enough sunlight in and keeps the area open and airy, still encapsulating the indoor-outdoor ambiance. Living life outdoors seems more appealing when your outdoor area has been transformed to accommodate your needs. Whether it’s an outdoor living room, a dining area or even paired with a full kitchen, your outdoor life will change for the better with these patio creations we have done over the years! Provide your guests with a refreshing place to sit back and relax in with this open patio facing the neighborhood. Whether it’s for a quick chat or conversation, this simple, neat and functional patio gives your home a welcoming curb appeal, no matter what time of day it is. An expansive patio such as these gives more room for variety of seating areas. If you’re in the mood for a chat or afternoon tea, there’s the table waiting for you. If however, you’d like a bit of a sun tan, then there’s also a daybed you can lounge on. This outdoor kitchen and dining area is suited for a family that loves to entertain and celebrate with a feast. Designed to accommodate cooking and eating at the same time, this patio makes efficient use of space to incorporate all the necessary elements while still having enough room for mingling. Enjoy your pool area better with a detached outdoor room such as this. Complete with a marble countertop for delicious food and drinks for your friends and family, comfortable, waterproof seats, and a grill for sumptuous meats, you’d feel like you’re on vacation every time you step out by the pool! Lounge by the pool on a nice summer’s day! An outdoor living room, kitchen and dining area in a single strip, imagine how you can transform your own patio into this multi-functional outdoor area that maximizes your space. With a pergola as a patio cover, the space below will remain functional even when it rains! Did you know pergolas can also be used as a patio cover? It’s classic style and design lends a charming look to your patio while giving much needed shade for your outdoor space. With a patio cover like this, spend your time outdoors in comfort. Want to know how to use pergola as a patio cover? Here are 3 ways to use a pergola as a patio cover. Giving the right amount of shade over your countertop, ensure your outdoor kitchen equipment is well shaded and protected while still having the right amount of lighting while you’re preparing and cooking your food. Keep your patio covered and your budget small with this simple pergola on the side! A wider version of the side pergola cover, this patio space can now easily be converted to a sitting area! A more traditional style of pergola, this patio cover easily attaches itself to the side and meets well with the existing roofline! A contemporary take on patio cover, this one sports a lattice-style which renders a neat and simple shade. To make it truly last, choose a durable wood like redwook or teak which ages gracefully over the years. Another trick to make it last longer and soften the look of your lattice patio cover is to add fabric over or under it. A patio cover does not need to cover the entire expanse of your outdoor space and block out full sunlight. With a pergola, you get the best of both worlds, protecting your outdoor space and any furniture or equipment stationed there, while still having enough natural light to work with while you outdoors. By having a pergola as a patio cover you will not only get the patio cover you need, you’ll also stay within your budget and get your patio more functional throughout the seasons! If you’re still on the fence wondering whether you should have a fire pit or not, let us give you 5 reasons to install one. Read on and be stoked about the benefits a fire pit can give you and your outdoor lifestyle! 1. Fire pits do not require a lot of space. Whether it’s on your porch, or even on a table, a fire pit can fit anywhere and provide warmth. All you need is a sizeable pit where the fire can form a nest of its own and spread its cozy heat all around. 2. Fire pits come in various shapes, sizes, prices, and fuels. Fire pits are a bit like water. It fits any requirements you may have. You don’t need to break the bank just to have one. You can choose whether you want it to run on a gas or propane fuel, or even on the smoke-free fireglass. You can also choose the fire pit materials. You can have it match your patio surface material or contrast it for design purposes. No matter what requirement you have, you can have the fire pit be flexible to what you can afford and need. 3. Fire pits naturally draw in people. Since time immemorial, human beings looked towards fire and any warmth source as a welcome and safe space to congregate. Our ancestors, upon discovering fire have always considered it as one of the main features a group needs. Before they had a home, a hearth defined the heart of the community. So the saying goes, the hearth is the heart of a home. In this case, give your yard a heart with a hearth that fits your needs. 4. Fire pits can also double as a mini outdoor kitchen. Done right, a fire pit can also be a cooking stove for your family. A simple grill rack can turn your fire pit into a grill. A much simpler way is to wrap your food in foil and let it cook among the coals. 5. Fire pits elevate the status of your yard from simply a decorative space to a functional space. With a simple fire pit addition, a fire pit turns your yard into an open outdoor area which is welcoming all-year round!